We love zero fuel vehicles, but the next best thing is a mode of transportation that can take you reeeeeeally far on just a little fuel. Vehicles with that ability compete in the SAE Supermileage competition, in which collegiate teams go head-to-head in Michigan to see whose vehicle is the most fuel efficient. This year’s winner can rack up an astounding 2,098 miles on a single gallon of gas. No, dear readers, that is not a typo. The single-seater car is an ingenuous feat of engineering and an incredible accomplishment from a group of university students. This year’s contest winner was a student team from Quebec’s Université Laval, which won the competition last year as well. The team, known as Alerion Supermileage, also scored wins in five out of eight of the previous contests. For the current entry, the team actually re-used the same shell, which seems like a smart idea given the prior successes. The single-occupancy car runs on just one cylinder. Making the vehicle as light as possible is one of the quickest ways to improve gas mileage, according to the team, and this year’s entry weighed in around three pounds less than the previous model. The students also upgraded the car’s fuel line as well as its electronic system and clutch system, closing gaps in energy loss that the team observed in last year’s competition. The 36th Supermileage competition was a contest between 17 U.S. teams and six in total from Canada. 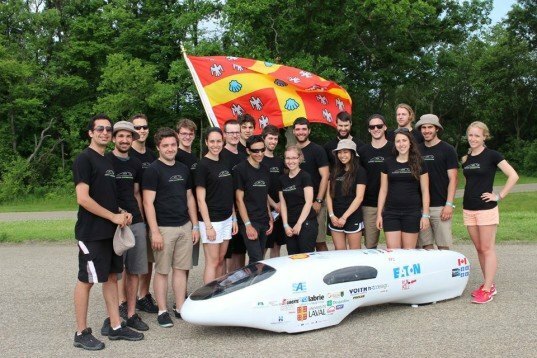 Of those, the Quebec team won a strong lead for first place, followed by Brigham Young University’s paltry 1,244 mpg and Northern Illinois University’s measly 1,057 mpg. The winning 2,098 mpg rating will be tough to beat, but rest assured that the Quebec university team will be back again next year in another attempt to best its own record.